This mod is done just for rFactor by Image Space Incorporated. This is not an official product of ISI. 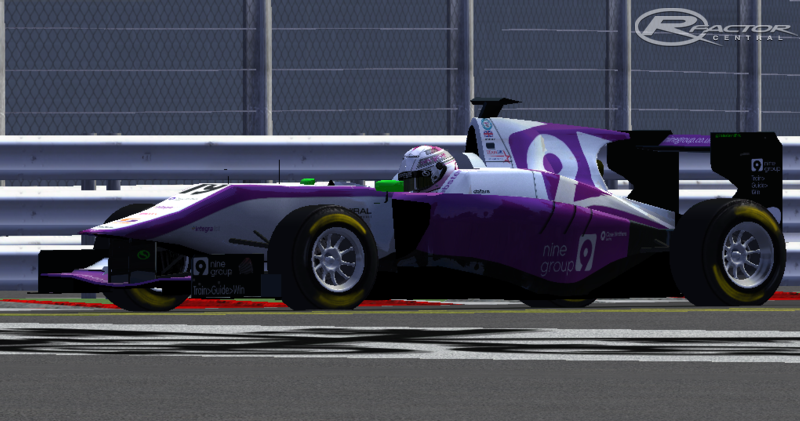 The mod includes all cars from the 2013 GP3 season with 27 liveries and 16 helmets. Fabiano Machado for the help with the physics. F1-SR for their excellent contents. Daimon for the helmets 3Ds. Just use it for Windows XP/Vista/7 and using an original rfactor game. By Slow Motion, Ilo and RFE stuff. You need to download updated tracks to this plugin, if not it won't works!! You can do it in the link down of this txt. You can see in the right part of the screen that every driver has a number of level assigned and their level stars. These values are done depending of the driver points standings and results, so that doesn't mean a driver has to be better or worst than the others. The stars and values goes from 50 to 100 and there is a difference of 10 for every star. Of course during an event it can change depending of the bad luck or crashes that the AI cannot prevent or made by the own user. These values are taken 12th October of 2013 so the Abu Dhabi Event results are not included. This is the taken data after driving a qualifying at the Valencia Grand Prix. Most of the driver positions delivered constant results in every event. During the race, it can change like we said before depending of mechanical problems or crashes. The cams done by Oliver Kwoka are quite realistic, perhaps it cannot be perfect. Anyway the immersion can be felt better in the driver cam. About the driver arms we think is better to keep them because it is much more realistic then static arms. Something all videogames have are the dynamic, moving arms. First of all in the game you can set three stops as maximum but in our mod you cannot refuel your car during the pitsops, that means you have to put the optimal fuel for the full race. You have to be careful with the tyres, during 20 laps races you should stop one time to put on new tyres, whil in sprint races you have to keep them. The best option is to attack in the firsts two laps, then take it easy on the tyres, but try to attack win the last four laps. If you do not ease them off in the middle part of the race, you will get in troubles, lose grip and speed on straights. The second option is to choose wet tyres, as the game is adapted to the RFE plugin, which adds rain to the videogame. But it just will works if you use an original version of rFactor game (buy the game), and your OS has to be Windows XP/Vista/7. Under Windows 8 it will not work. The plugin is in the "Add-on" folder when you install the mod. In this mod, the default Gearbox configuration is quite optimal but probably not the best. In any case for people who don't know how to setup the car it can be very comfortable. Of course it is setup because it could be optimal for every track from the season, but maybe in Monza you can arrive to the limit of the 6th gear. The second innovation is the downforce of the car, in fact of front and rear wings. The limitation is 7 degrees in races, but we limit it for the full grand prix. The mininum speed you can get in max downforce is 283 km/h. But it also depends of the track and terrain, for example in Spa, can be usual that you just get 275 km/h. We hope you enjoy the mod and we appreciate all the help and support we recived from the social networks and forums. There are currently no setups for 2013 GP3 Series. Add a Setup. I also found too much power with this mod. As you said, tweaking the tire and car physics made a big difference. Suggestion - can you make all the necessary tweaks to make this mod more realistic and pass them on to Carlos so he posts them as a patch and we can all use them? It is very helpful if people who are good at certain things can help others to improve the mods. Look forward to an official patch so everyone can enjoy it. ASWELL your 2013-version!? There must something wrong! The difference is soooo huge! You have modified the tire grip to a very unbelievable low rate. I ask: why? And: Why don´t you ask people to help when you have such less experience? I have tweaked the tire and car physic to a believable behavior for myself. The power is 400 hp and the car runs 280 km/h. If you are interested I can send you the files. PM me. the mod is good but, its possible to put the arms off ? is very bad driving with this arms..
Hello, I found very good mod like the other versions except the power of the car which looks very unreal and also tire grip. The car spends too much tire and is much understeer. Outside it is sensational! Another question is about the templates already available? Thank you!